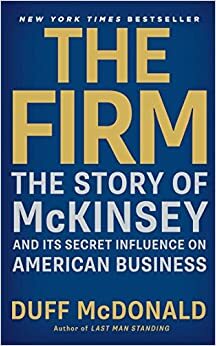 The book covers the story of McKinsey - right from its inception by the eponymous McKinsey to its becoming one of the most dominating business organisations in the world. An organisation that is present in the most unexpected of places for a 'corporate' to be present in - from the power corridors in Washington to war zone in Iraq. And while it covers the story of McKinsey it also looks at its impact on its clients, hence the industry and hence, the global economy itself. It talks about the successes and it talks about the failures. It talks about the values and when they were found to be lacking. It talks about some of the stalwarts - both the ones worth remembering and ones worth forgetting. "This book is written just like a tabloid", a friend of mine commented. I agree. Its spicy. Very easy to read and pure entertainment, unlike typical business books. And that's not even the best part. The best part is that the author managed to get access to important leaders of an organisation that otherwise keeps itself at a safe distance from any kind of attention - a feat that gives the book credibility and a green rating. Is it totally accurate? I doubt it. It is difficult to understand the philosophy of an organisation with as much complexity and proclivity to nuances as McKinsey has from an 'outside-in' perspective. It is like a person trying to understand the feelings of another person. You need to be a psychologist to even come close. Duff McDonald may be brilliant in what he does, but he certainly isn't an organisational psychologist capable of understanding what is going on in the sub-conscious of 'The Firm'.